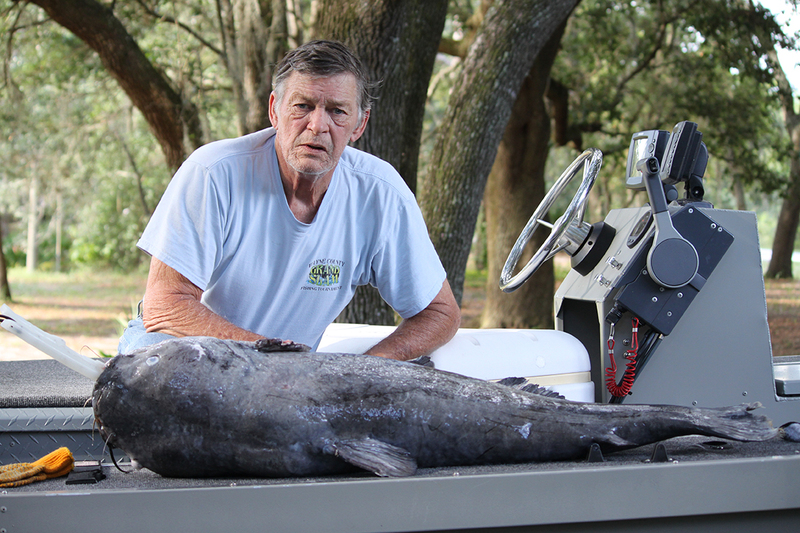 Bill Stewart, 66, of Weeki Wachee, caught a 69-pound, 8-ounce blue catfish on the Choctawhatchee River, near Ebro, during the Choctawhatchee Catfish Roundup tournament on May 30. He beat the previous state record by 5 pounds. Stewart had landed four flatheads and a nice channel catfish before he put the head from a skipjack herring, which he had caught earlier, on a big circle hook. Fortunately, his reel was loaded with 100-pound line because the blue catfish that took the bait a few minutes later was ready for a fight. After getting a preliminary weight on tournament scales, he was informed the fish was approximately 69 pounds and if certified by the Florida Fish and Wildlife Conservation Commission (FWC) would be a state record (See video at bit.ly/FLBlueCat). After trying to find a certified scale himself, he arranged to meet FWC Investigator John Brown, who helped him get an official certified weight and measurements and to have the application notarized. FWC fisheries biologist Paul Thomas then came to Stewart’s on Monday evening to complete the process and verify that it was a blue catfish (Ictalurus furcatus). The official measurements were 49.5 inches in total length, with a girth of 31.75 inches. “Stewart’s blue catfish is the fourth Florida Freshwater Fish Record set in 2015, following two shoal bass and a flier, all from the Florida Panhandle area. Just one more reason why Florida is the ‘Fishing Capital of the World,’” said Tom Champeau, director of the Division of Freshwater Fisheries Management. The previous state record blue catfish was also caught on the Choctawhatchee River, by James Mitchell in 2008. Stewart says he is now after the flathead catfish record, which currently stands at 55.05 pounds and was caught in the Chipola River in 2011. Anyone can try their hand at catching a record fish during license-free weekends. On June 6 and 7, people can fish for saltwater species without a saltwater recreational fishing license. On June 13 and 14, the state won’t require freshwater anglers to have a recreational license. All other fishing regulations – seasons, limits and sizes – still apply during these special opportunities. State freshwater records require a biologist to verify the species and have a certified weight for the notarized application. The FWC maintains records for 33 freshwater species. Big Catch is a long-standing, family-friendly angler recognition program for those same 33 species. It recognizes anglers with a certificate if they qualify by submitting a photo of their catch online and if the catch exceeds specified weights or lengths. There are youth, specialist, master and elite angler awards as well. People can learn more at BigCatchFlorida.com.